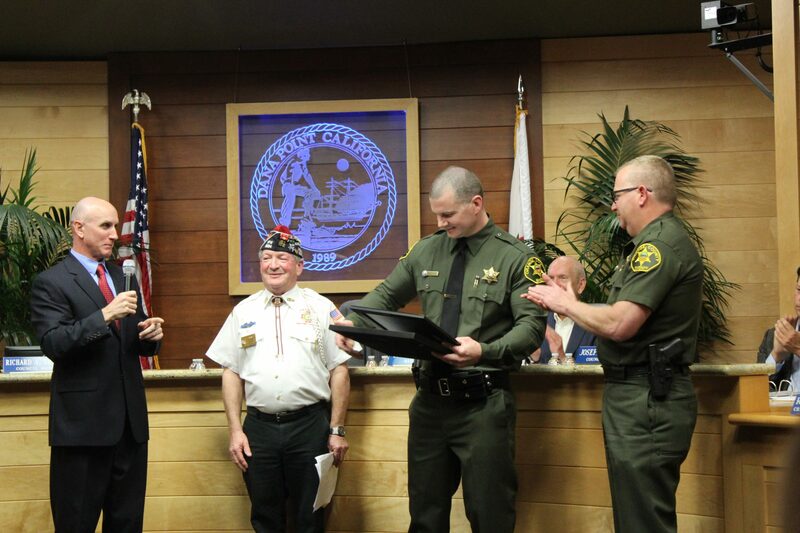 During a recent City Council meeting, Deputy Zachariah Scott was awarded the VFW National Award for being the top law enforcement officer of the year. Scott was previously selected by the Dana Point VFW Post 9934 as the law enforcement officer of the year. After receiving top marks locally, he received first place in the VFW Southern California district, then placed first at VFW State level. In addition to Scott, Captain Justin Neville from O.C. Fire Station #10 in Dana Point was named first at the Southern California district level, and second at the state level for the top firefighter of the year. Reserve Officer Jason Smigel from O.C. Fire Station #7 in San Juan Capistrano was selected by the Post as the top EMT officer of the year. He was named first in Southern California at the district level, and second at the state level. “We are blessed to have such dedicated public servants keeping our cities safe,” said Wayne Yost, senior vice-commander for the Post.